David Mamet Rebooting ‘Have Gun – Will Travel’ for CBS!!! It seems like everything is getting rebooted or remade. CBS is developing ‘Have Gun – Will Travel’ with David Mamet heading up the project. Westerns are making a come-back…finally. Maybe the Hatfield’s and McCoy’s mini series had something to do with it. But, CBS has made a script deal to produce the project. Now, I’m waiting for a ‘Gunsmoke’ reboot. If the pilot comes to a full series, it might go well with the upcoming ‘Vegas’ series which is also a Western that will star Dennis Quaid and Michael Chiklis. Let’s not forget, NBC is developing ‘The Frontier’ as Fox is developing a Wyatt Earp projects sans Kevin Costner. Mamet wil write and executive produce, and if CBS likes it enough, he will direct the show. The original ‘Have Gun – Will Travel’ originally aired on CBS from 1957-63. 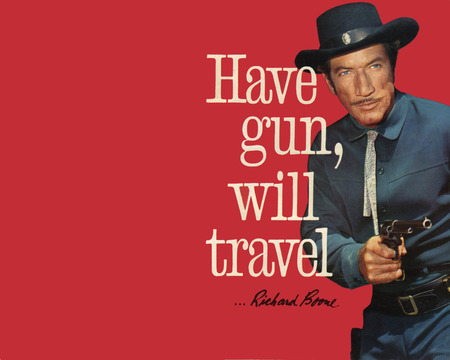 During its six-season run, the drama starring Richard Boone as Paladin not only delivered top-five ratings but also spawned a successful radio show according to THR. Mamet is known for his writing mostly, but has also produced and directed. His credits include ‘Glengarry Glen Ross’, ‘The Untouchables’, ‘House of Games’, and ‘Hannibal’. I think he will do well with this remake. This entry was posted on Wednesday, August 22nd, 2012 at 12:01 pm	and is filed under News, Television. You can follow any responses to this entry through the RSS 2.0 feed. You can skip to the end and leave a response. Pinging is currently not allowed. « ‘The Rocketeer’ Will be Remade!! !